NEW ORLEANS, Louisiana, July 26, 2010 (ENS) – Oil spill response vessels and drilling rigs are returning to their places above BP’s blown-out well in the Gulf of Mexico today after they were evacuated Friday to avoid the impact of Tropical Storm Bonnie. But Bonnie weakened and was only a tropical depression with winds near 30 mph when it moved into the gulf on Saturday, according to meteorologists with the U.S. National Hurricane Center. The center of Bonnie came ashore Friday near Cutler Bay, about 20 miles south of Miami. It moved into the eastern Gulf and was about 165 miles east-southeast of the mouth of the Mississippi River Saturday morning. The storm posed no danger to the vessels working to try and kill the runaway well. At the order of National Incident Commander retired U.S. Coast Guard Admiral Thad Allen, the containment cap over the damaged wellhead remained in place during the evacuation and no oil was released into the gulf. Ships performing acoustic and seismic monitoring to ensure the integrity of the wellbore, and they have detected no problems with the containment cap. By today, all assets are expected to be back in place. “The critical ones are out there right now,” said Allen Sunday. Vessels that have restarted their work include the Development Driller III, which is responsible for drilling the relief well. Before suspending operations, Development Driller III had drilled the first relief well to a depth of 17,864 feet below the gulf surface and Development Driller II had drilled the second relief well, a redundancy measure taken at the direction of the administration, to a depth of 15,963 feet below the surface. Allen also said the timeline for the so-called static kill procedure and the relief well will be delayed about a week, a decision that was made based on a series of recent meetings with the federal government science team, led by Energy Secretary Chu, and BP representatives in Houston. The static kill would pump mud in from the top, and the relief well would allow mud and cement to be pumped in from the bottom of the damaged well. Allen explained that the two operations are linked. “We believe that we should not start the static kill operation until we have installed the last liner run in the bottom of the relief well. And just to explain this, the relief well bore has been drilled, but the last final section that we want to reinforce with pipe needs to be done before we can begin the actual interception of the well. And that’s called running a casing line or basically a hollow steel pipe that reinforces a well bore,” he said. “Right now that well bore is open and does not have the casing in it. And it is not very far away from a place that we had concerns about regarding well integrity. And we did not want to run the risk of starting the static kill procedure, put pressure on the well, while we were in the proximity of a relief well that did not have the reinforcement of the casing,” the admiral said. “So for that reason, the sequencing will be we have to have the casing line run first on the relief well before we would attempt a static top kill,” he said. Onshore, the storm has caused some oil and also some containment booms to be displaced, damaging fragile marshlands. 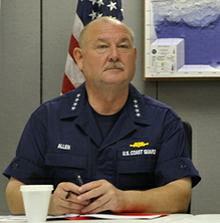 “We expect some oil that was there before the storm to be displaced,” Allen told reporters Sunday. 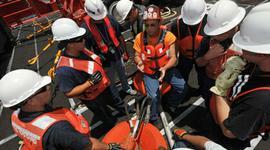 Now response operations will be directed toward mitigating the oil’s impact. The Coast Guard suspended skimming operations Saturday due to Tropical Storm Bonnie. Skimming operations will continue now that the storm threat has ceased. Statewide in Louisiana, there are 389 skimmers working to collect and remove oil spilled from BP’s Deepwater Horizon well before it was capped earlier this month.